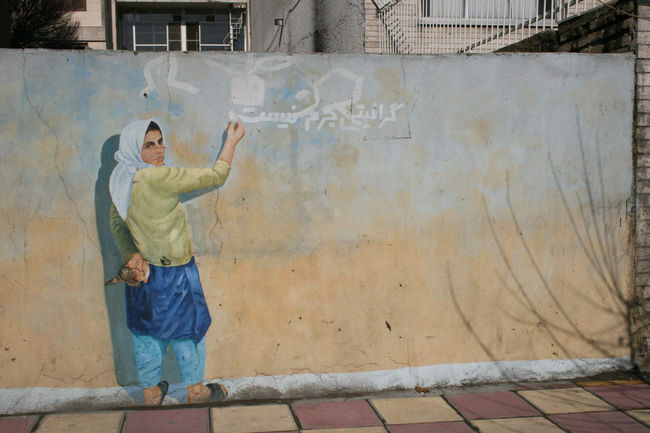 Iranian street art on human rights, war, poverty, dictatorship, censorship. Posted on Al Monitor February 11, 2018. “You are no artist if you are drawing on a wall with spray paint. You are either a vandal or a political activist scribbling a slogan,” Iranian graffiti artist “Mad” said of the longstanding public’s opinion on street art. The first generation of Iranian underground graffiti artists started painting on Iran’s walls around the beginning of the 21st century, and the new generation of Iranian artists continue to transform the walls of Iran’s cities — from Tehran to Tabriz, from Mashhad to Shiraz. “Our initial problem was that no one would differentiate between our work and vandalism. Street artists not only faced public intimidation in Iran, but they were also threatened by the police, the Basij forces and other security organizations,” Mad told Al-Monitor. Iran’s walls have played a complicated and contradictory role in citizen activists’ protests. In the years leading up to the 1979 revolution, political slogans or images of leaders of the revolution began to adorn the country’s walls, turning public spaces into a platform for calls of a revolution. Following the establishment of the Islamic Republic, the walls became a battleground for different political groups. In 1980, with the start of the Iran-Iraq War, they became a platform for advertising the “Sacred Defense.” When the war came to an end in August 1988, the walls once again became a place for the ruling establishment’s Iranian, Islamic and anti-imperialistic indoctrination. In fact, most writings and images that covered the walls during this time were sayings by the Prophet Muhammad, Shiite imams, Islamic Revolution founder Ayatollah Ruhollah Khomeini, Supreme Leader Ayatollah Ali Khamenei and war heroes. With the arrival of a more modern style of art to the streets, this age-old tradition also came to an end. In the new era, Iranian street artists would sneak out at night, away from the eyes of the police, to paint their drawings on walls, illustrating themes of human rights, war, poverty, dictatorship and censorship. Karan Rashad, known as A1one, is one of the pioneers whose artworks first appeared on the walls of Tehran in the late 1990s. His stenciled works often have a social and political theme to them, whether it is protesting the filtering of the internet or the hanging of a dictator such as Saddam Hussein. Rashad has held dozens of exhibitions abroad, from the United States to France, but very few of his artworks are still on display in Iran, which he left in 2012. In Iran, just as in most other countries, spray-painting on a public street is considered damaging public property and is deemed illegal. However, Iranian law does not stipulate a clear punishment for this crime. “The main problem is you don’t know what kind of danger you will be facing. 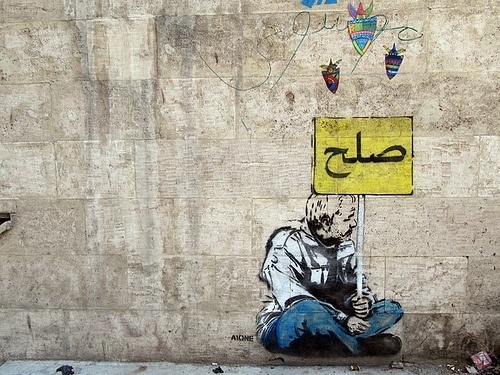 This means [you don’t know] what you will be charged with if you get arrested,” said Ill, another Iranian street artist whose stencil work can be seen in the northwestern city of Tabriz. His most famous artwork is a manipulated human portrait, in which there is a mute sign instead of a mouth and key holes instead of eyes. It is a criticism of censorship. In 2006, the Tehran municipality called on Iranian artists to send in their designs and ideas for wall murals for the city. They ultimately selected the painter Mehdi Ghadyanloo, whose work wound up being quickly seen on close to 100 walls across Tehran. Ghadyanloo’s drawings on the smog-ridden municipality’s walls depict a utopia of a green and clean city with blue skies and happy people. Mad said most street artists boycotted the municipality’s call at the time. “The main reason was censorship, because the artist was not allowed to paint just any theme. This goes against [the principle of] street art. For instance, 90% of my paintings would not go over well with the Iranian municipalities because it contradicts their ideology, position and demands,” he said. Mad said the public has warmed to street art after nearly two decades. “Now there is at least more awareness and knowledge about street art in Iran. Sometimes when I work, I expect poor public response, but then very unexpectedly I see that they are watching over me, giving me advice on what to draw and even talking to me about my work and sharing their opinion. I have had positive feedback by the public in recent years,” he said.